Ministerial roundtable Green collar jobs? Poverty in work Down to business Myths and migrants Renminbi or dollar? Can China’s economy avoid the doldrums? Applications for permission to reproduce or translate all or parts territory, to the delimitation of international frontiers and of articles from the OECD Observer, should be addressed to: The boundaries and to the name of any territory, city or area. 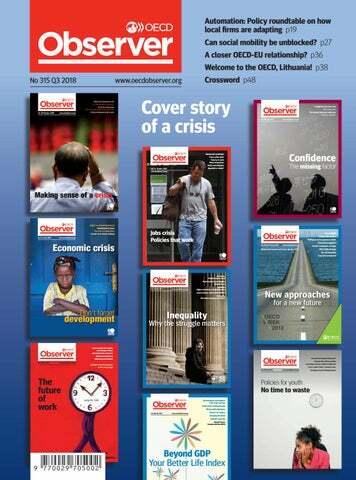 Editor, OECD Observer, 2 rue André Pascal, 75775 Paris, cedex 16, France. Defining moments I sometimes wonder why it is not more central in current debate. To my mind, the financial crisis is the defining moment of our time, the beginning of a new period. Robert Grimm, https://www.linkedin.com/feed/update/urn: li:activity:6445680536093544448 ____ Small enterprises will need reliable and affordable power, internet, capital and know-how (training) to begin this journey. Larger companies should play a B2B mentoring and financing role. those institutions do right and what they do wrong–unflinchingly. Miriam Brett @MiriamBrett In case anyone was under the impression that UK workers are getting a fair deal, here’s a snapshot of OECD wages–or lack thereof, in our case–from 2008 to 2017. You’ve been lied to, dear OECD. Your report (Education at a Glance) was based on data sent to you probably by our Ministry of Education. The data you were given nearly doubled what we are in fact paid. I will be happy to provide you my salary sheet. or post your comments at these portals: www.oecdobserver.org, www.oecdinsights.org, or at the other OECD portals on this page. Tax havens did not provoke the financial crisis of 2008, but the bright light that the crisis shed on them is quite remarkable. And that’s a good thing! Boosting future growth today Eritrean apprentice (right) in Dortmund, Germany. Structural reforms could give a sharp boost to living standards, improving GDP per head by as much as 8% under certain conditions, according to The Long View: Scenarios for the World Economy to 2060. Furthermore, the world’s economic centre of gravity will continue to shift toward Asia, the report says. quarter of 2018, compared with 2.6% in the previous quarter. The OECD’s composite leading indicators point to easing growth momentum in the OECD area as a whole. By using data from the likes of order books, building permits and long-term interest rates, these leading indicators help anticipate trends and turning points in the economic cycle. Easing growth momentum is anticipated in large European economies including France, Germany, Italy and the euro area as a whole, as well as in the UK. Energy prices rose by 11.1% in July, compared with 10.4% in the year to June, while food price inflation was stable at 1.8%. Excluding food and energy, OECD annual inflation increased to 2.1% in July, compared with 2.0% in June 2018. OECD-area inflation increased to 2.9% in July 2018, compared with 2.8% in June. Short-term prospects for the Korean economy are good, but productivity remains relatively low, and the country faces the most rapid population ageing in the OECD area. www.oecd.org/korea/ Norway’s law enforcement institutions have demonstrated commitment and ability in combating foreign bribery. Its new Penal Code, however, could create obstacles to enforcement. www.oecd.org/norway/ Germany continues to demonstrate a high level of anti-bribery enforcement. However, there are concerns that there is insufficient enforcement against companies. www.oecd.org/germany/ The European economy is growing robustly. The current economic expansion should be used to speed up implementation of reforms to the euro area architecture. www.oecd.org/eu/ Hungary has made progress in greening its economy and cutting emissions, but it needs to speed up efforts to replace fossil fuels with renewable energy sources and promote sustainable transport. www.oecd.org/hungary/ Lithuania’s economy has grown faster than most other OECD economies over the past decade, unemployment continues and the US, to 3.9%. It increased by 0.1 percentage point in Japan, to 2.5%, and Korea, to 3.6%. International merchandise trade among G20 countries, seasonally adjusted and expressed in current US dollars, contracted in the second quarter of 2018 following eight consecutive quarters of growth. G20 exports declined by 0.6% and imports by 0.9%. Laurence Boone has taken up her duties as new Chief Economist of the OECD at the end of July, replacing Catherine Mann. These extracts from blogs appeared in Q3 2018 and courtesy of OECD Forum Network, OECD Insights, OECD Education & Skills Today, OECD Ecoscope, OECD On the Level, Wikigender, Wikiprogress and other content and social media platforms managed by the OECD. Technology influences everything Technology is changing how we work as well, including automation, which is predicted to replace as many as 14% of jobs and to significantly change another 32%. 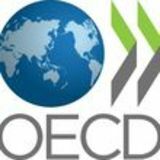 Engaging with the global community Anticipating challenges, building resilience The OECD is playing a leading role in pushing the debate forward in the economic policy community, both among academics and in international institutions and think tanks. Dialogue and engagement: People matter As a forum in which governments and partners work together, we are stepping up our collaboration with civil society, business and trade unions, and reaching out to a wide range of citizens in more and more regions and countries. Only through international co-operation can we achieve real, sustainable progress. Raising the bar Our global economies need to be shaped to ensure that prosperity is more evenly shared and that economic and technological progress benefit all. In light of the many risks, what should policymakers do? The immediate priority is to preserve business confidence and investment by reducing policy uncertainty–including by restoring international dialogue. Enhancing resilience is also key in the financial sector as well as, in the case of Europe, by completing the banking union launched in 2012. Global growth is projected to be at 3.7% in 2018 and 2019 in our latest Interim Economic Outlook, which remains an elevated pace. At the same time, it also reflects weaker prospects than anticipated just a few months ago, and some fragilities. Growth performance has become less synchronised across the world: while it remains strong in the US, India and China, it has faltered in many other economies. Unemployment has continued to decline and is now below its pre-crisis level in the OECD, but wage growth remains persistently weak, raising uncertainties about how much spare capacity remains in the labour market. In other words, many workers would like to work more hours in Europe, or have left the labour force in the US, fueling poor well-being perceptions. The consequences of rising trade restrictions are already visible. World trade in goods has markedly slowed in recent months, with acute impacts in the sectors directly targeted. Down the line, higher tariffs mean higher prices for consumers, less investment and fewer jobs for workers, and ultimately losses in productivity and standards of living. More worryingly, risks–trade, emerging economies’ sensitivity to tightening financial conditions, politics, finance–are intensifying, casting shadows over the outlook for the coming months and years. In case risks materialise further, there is little space left for monetary policy to react in advanced economies. This makes it all the more important for countries currently enjoying strong growth not to widen fiscal deficits, but instead to rebuild room for manoeuvre and expand public investment to shore up the foundations for sustained growth for all. In Europe, political risks could harm growth and social cohesion. Brexit is an obvious source of uncertainty. As for Italy, public finances need to respect EU rules and ensure debt sustainability while privileging productive investments badly needed to raise growth. More largely, the EMU policy framework needs to be strengthened to enhance confidence, growth and ensure the euro area thrives as it should. Another risk that has started to dent growth is, in emerging market economies (EMEs), the effect of rising interest rates and US dollar appreciation. Floating exchange rates have played their cushioning role which has limited contagion so far, but measures to ensure persistent macroeconomic policy credibility and resilience in more vulnerable economies are essential to safeguard financial stability. Is an unintended result of the derivative market the creation of more and more risk by those who sell such instruments knowing they will not be holding the risk themselves? Would they have had more incentive to confirm the creditworthiness and asset values of the original borrowers had at least some of that risk remained on their balance sheets? Is that not an important element of what we witnessed with the subprime crisis? Creators and sellers of such derivative instruments should continue as guarantors, jointly and severally, of the underlying value, just as endorsers of a cheque or bill of exchange do. Ottoman tulips and historical precedents Returning to the question of bubbles, how does one foresee that there is a bubble destined to collapse? And is there some commonality between historical bubbles from which lessons can be drawn that raise red flags for investors? Consider the tulip bubble of the 17th century. The Ottoman Empire supplied the first exotic tulip bulbs to the Netherlands at the end of the 16th century. The Dutch appetite for exotic tulips was the foundation for economic history’s first infamous bubble. At the height of the bubble, we are told that an Amsterdam man was offered, but refused, 3,000 guilders–the annual income of a wealthy merchant–for a remarkable tulip bulb called Semper Augustus. To put it into perspective, shortly thereafter Rembrandt received about one half as much for painting “The Night Watch”, which remains a highlight of the Rijksmuseum in Amsterdam. It was reported in The Economist of 4 October 2013 that in the 1630s a sailor was thrown in a Dutch jail for eating what he thought was an onion. It was in fact a tulip bulb. Apparently the value of that supposed onion equalled the cost of feeding an entire ship’s crew for a year. This craze ended–the bubble burst–with the collapse of the tulip market in 1636–37. a Better Life? For nearly a decade, the OECD has been working to identify societal progress – ways that move us beyond GDP to examine the issues that impact people’s lives. The OECD’s Better Life Index is an interactive tool that invites the public to share their thoughts on what factors contribute to a better life and to compare well-being across different countries on a range of topics such as clean air, education, income and health. Over five million visitors from around the world have used the Better Life Index and more than 90 000 people have created and shared their personal Better Life Index with the OECD. This feedback has allowed us to identify life satisfaction, education and health as top well-being priorities. What is most important to you? The OECD Better Life Index enables you to rate countries according to the importance you give 11 topics. Each petal of the flower represents one topic and the size of the petal the countryâ&#x20AC;&#x2122;s rating for that topic. POLITICO Pro provides the most distinct and authoritative policy news coverage of Europe and beyond and because of that, Pros depend on us to do their jobs. Roughly 14% of jobs in OECD countries are highly automatable, while another 32% will be transformed by automation. By 2019, it is estimated that 1.4 million new industrial robots will be installed in factories around the world. How can local firms and their workers adapt to this? How can policy help? As policymakers and experts gather to discuss such issues at the 14th OECD Forum for Local Development Practitioners, Entrepreneurs, and Social Innovators in Porto, Portugal, 18-19 September 2018, we ask our panel: How have local firms and their workers been adapting to automation? How can policy help? A worker in a state-of-the art factory, in Slany, Czech Republic, March 2018. Left behind or leapfrogging ahead? Even so, much more needs to be done to adapt policies to the needs of knowledgebased and technology-based societies. Governments have an important role to play and a unique ability to mobilise multiple stakeholders–by connecting them and helping to match the needs and interests of workers, large and small businesses, as well as other relevant actors and institutions. Local actors also gain in engaging with the policy process since they are a valuable source of knowledge and expertise, and can help to anticipate future challenges that can be addressed in a more timely and effective manner. Building on social dialogue, governments therefore have an important role as both facilitators and enhancers of change, by prioritising investments in education and lifelong learning, while modernising and adapting education and training programmes to current and emerging needs. Creating flexible pathways for reskilling and upskilling throughout people’s lives is particularly important. Governments also have key roles as regulators. These changes require us to look closely at our national legal frameworks: do they address the new realities that are emerging? What changes are needed? Is better enforcement of existing laws required? The costs of inertia in this field may include increasing inequalities and gaps in social protection, unfair competition, privacy issues relating to data protection, unaddressed health and safety risks and new forms of social exclusion. knowledge transfer and the like, are catching the wave of these new trends and reaping the benefits. Simplon.co in France is a network of learning centres that has been offering free coding classes to the unemployed since 2013. Today, it is in 40 cities in France and around the world. But not all social entrepreneurs have been as successful as Simplon.co in scaling up. To do so, social entrepreneurs need clear and tailored legal frameworks and access to finance. funding, create jobs, and develop skills, but improve our cities and consequently our lives. How do we prepare for this? Many people will need new skills and this kind of training should begin early, in schools. Our education, training programmes and public policies must adapt to the new realities of automation. In the workplace, employees will need to beef up their training as many of the skills of workers today will become obsolete tomorrow. Companies will need to function as academies, teaching their employees how to work hand-in-hand with algorithms, artificial intelligence and robotics. Public authorities such as metropoles, regions, states, and national and international institutions; economic stakeholders like firms and entrepreneurs; and civil society must encourage this dynamic in order to create a new economic paradigm that is inclusive and sustainable. *OECD (2018), Putting Faces to the Jobs at Risk of Automation, March, Policy Brief on the Future of Work, http://www.oecd.org/employment/Automation-policybrief-2018.pdf Will all workers be displaced by machines? As history has shown, when jobs are destroyed, many others are created. The future lies in a closer collaboration between humans and machines. Agriculture, for instance, is a sector in which automation and other forms of technology have brought considerable advances. But much farming still requires back-breaking work to prepare soil, pull weeds, harvest crops and transport heavy loads. To help fruit and vegetable farmers, a local French firm, Toutiterre, invented the Toutilo. It is a robot or, better yet, a “cobot”, for collaboration between robots and humans. It combines farm work, task automation and robotics into one technology, making the process faster, safer and more efficient. It shows how robots can supplement, not supplant, humans. The globalisation of the world’s economy, jointly with the digitalisation and automation of traditional production, has become both an opportunity and a challenge for smaller companies and nations–a particularly “human” challenge. needed in an automated world are problem-solving, empathy and navigation. Second, policy can provide locally tailored responses and transition support for people whose skills have been displaced and devaluated by automation. Entrepreneurial endeavours, no matter how small or remote, should be encouraged and showcased. Finally, the digital and global world of work requires mobile and digital mind-sets in smaller municipalities to be the same as those in cities. Policy should improve business and labour market dynamism in order to help people manage transitions between jobs and gigs more fluidly and with adequate social security. Skills education should be better and more quickly matched with real needs. The three industrial revolutions that have so far shaped the world of work by introducing the steam engine, mass production and electronics each resulted in an average 9-10% increase in the labour demand for new jobs. It is likely that the current digital revolution, also called Industry 4.0, will not just automate jobs, but create new ones. In Australia, one in five employers responding to digitisation expect to grow their staff within the next two years, and more than half plan to retain their staffing levels. Recent global perspectives are also starting to paint a less gloomy picture than that of “robots taking over everyone’s work”. According to McKinsey, about half of paid activities worldwide can be automated, but these only form part of the job market; just 5% of professions can be fully digitalised. Work will change, not disappear. However, this change requires immediate action to adjust the skills of workers, especially for small and medium-sized enterprises (SMEs). Three points seem particularly relevant in the context of local businesses and their staff. Targeted skills’ training, support of the most vulnerable, and flexible labour markets can form a stable bridge to the next generation of work. It is a commune which lives in proud isolation: nothing gets out and nothing gets in large secondary school attended both by children from Trappes and by those from rich neighbouring communes was joined by a second school to which all the pupils from middle-class and wealthy backgrounds gravitated. Then, at the start of the 2000s, a new, socialist mayor was elected on the promise of building a large mosque in Trappes. After years of efforts by the Communist Party to knit a social fabric, religion was intruding in the form of an Islamism close to that of the Muslim Brotherhood. which the organisation was founded, and which has helped improve billions of people’s lives. Going back in time is not an option. To discourage colonial farmers from burning down their houses for the nails, the English Crown promised to provide the equivalent number of nails to the former tenants, leaving the houses standing for the next tenants. For social mobility to succeed, policies must restore both opportunities and confidence. Burning down the house is not an option either. deforestation-free trade by forming The Amsterdam Declarations. How do we transform these aspirations into action? Until now, the complexity and opacity of global supply chains has made it difficult to tackle deforestation within mainstream markets. Much effort has been invested in traceability and certification but for the vast majority of commodities with deforestation risks, there is simply no information to support action and policy implementation. The data revolution underway may provide solutions. Advancing deforestation in the Amazon Basin We are eating our way through tropical forests. Whether it’s a cappuccino for breakfast, a burger for lunch or a chocolate bar as an after-dinner treat, the things we consume in OECD countries are often linked to deforestation in the tropics, where trees are falling at alarming rates. Agricultural expansion to produce commodities like beef, soy, coffee, palm oil and cocoa has driven over 70% of tropical deforestation in the last decade. Deforestation has a signiﬁcant impact on local livelihoods in developing countries. It destroys the habitats and ecosystem services that underpin the security of our water, food, and energy resources. supply chain. They will be able to use this data to better monitor forestrelated risks and identify opportunities. Reliable, comprehensive and up-to-date information is essential for effective partnerships between producer and consumer countries. It also informs policies that ease market access for legal and sustainable products while discouraging those linked with supply chains tainted with, in this case, deforestation. soy is the most internationally traded, and Brazil is poised to overtake the US as the world’s leading exporter of soy. Global demand for this commodity is driving a significant loss of native vegetation in parts of Brazil’s ecologically crucial Cerrado region. While China is by far the biggest importer of soy grown in the area, and increasingly so in 2018, various OECD countries have also been importing large quantities of soy with a high risk of deforestation. This supply chain transparency can go a long way towards improving production practices, procurement and investment policies, and supporting independent monitoring schemes and public development planning. This is not just about deforestation, but about the social and environmental quality of the commodities we produce, trade and consume. It is essential to our sustainability agenda and reinforces the goals of the Global Partnership for Sustainable Development Data. Governments can seize this opportunity and start deploying their own data to support sustainability. They could contribute their customs records to support rapid-response monitoring systems and improve market intelligence on global commodity markets. This will help shape a future in which commodity trade is not accompanied by widespread environmental destruction and social exploitation. And that should make our favourite foods taste even better. *REDD stands for Reducing Emissions from Deforestation and Forest Degradation THE VIEWS IN THIS ARTICLE ARE THE AUTHOR’S AND DO NOT NECESSARILY REFLECT THOSE OF THE OECD OR ITS MEMBER COUNTRIES. The blue colour key refers to areas in which more than 80% of the soy has been produced or purchased by companies that have committed to zero deforestation. Protecting our water Gabriella Elanbeck, OECD Observer The celebrated marine scientist Jacques Cousteau once said that “all life is part of a complex relationship in which each is dependent upon the others, taking from, giving to and living with all the rest.” This is especially true of water. Freshwater management, oceans and marine ecosystems are intimately linked to almost every other environmental and humanitarian issue. Take a developing coastal city: the kind of dynamic and bustling urban centre where much of the world’s population will live in the future. In such a city, much of the population makes a living from fishing or from work at the city’s port, a trade hub where the circulation of ships disturbs underwater ecosystems. Tourists swarm the best beaches, and water must be efficiently managed to serve both tourists and, more crucially, the city’s own resident population. Efficient water management links together a series of sectors like construction, energy and sanitation, on which daily life depends. It also bears strong implications for social justice and stable governance of the city itself. In short, water-related policy issues are everywhere, and the problems currently plaguing water systems and marine environments will have serious consequences for areas ranging from trade to agriculture to inclusive growth. If water, ocean and ecosystem management are crippled, then human development is hampered too. The scale of our reliance on the marine environment is immense. It supports 61% of the world’s gross national product (GNP) and about 500 million livelihoods which depend on ocean-related activities. Beyond ocean shores, effective water management on land is vital for ensuring that societies are stable, fair and resilient. Yet as many as 2.1 billion people worldwide still lack access to clean and safe drinking water at home. The pressures on the water systems and marine environments we depend upon continue to mount. Oil and gas activity, deep-sea mining and pollution from plastics have wrought havoc on marine environments, damaging over 60% of the world’s major ecosystems. Water infrastructure is strained by skyrocketing populations and often unsustainable or environmentallyunfriendly construction. With climate change adding fuel to the fire, what kinds of policies can address these interrelated challenges and guide us towards a more sustainable equilibrium with the marine environment? The first step for oceans would be to preserve once-flourishing ecosystems. Marine protected areas are one tool to combat further ecosystem decay and encourage regeneration. Biodiversity should be mainstreamed into other policy areas and the legal frameworks around it strengthened. And strong policies to limit pollution should be implemented and enforced, along with policies aimed at limiting consumption of non-recyclable plastics more generally. transparency and accountability, in both theory and practice. It is now time to go further and stamp out corruption. There needs to be greater public involvement, especially among the younger generation. The OECD Recommendation on Public Integrity stresses the importance of transparency and the engagement of all actors at every level in the governmental decision-making process. The young citizens of Tunisia should be informed, consulted, and encouraged to take part in formulating public policies and evaluating government action. Many such initiatives have been taken. In its report, Open Government in Tunisia, the OECD draws attention to the steps taken by the government and civil society in this field. These initiatives should be encouraged and embedded in a systematic approach with the aim of including young people in the design, monitoring and evaluation of public decisions. It is important to create mechanisms to encourage young people to report violations of integrity more systematically. As suggested in the regional report Youth Engagement and Empowerment in Jordan, Morocco and Tunisia, networks of schools, youth centres and cultural organisations can play a critical role in raising young people’s awareness, and helping them take a firm stand against corruption. The OECD supports its member and countries from the MENA region in implementing public policies that consults with and involves citizens, notably young people, in this fight for integrity. The means are many and varied, from the promotion of measures supporting an open government, the citizen consultation and participation practices, to the implementation of the principles of freedom of information, the promotion of open data and the establishment of monitoring agencies (especially within local public organisations). If it is to be successful, Tunisia’s democratic, pluralist experiment–the first in the MENA region–must be supported by sustained action against corruption, with young people driving this change. But young people must be empowered. The future of the country depends upon it. like the three-headed Hecate, are looking in every direction for an answer. on a stronger, more systematic and institutionally more robust basis? Could Hecate hold a key by pointing to a third way? Even the most ardent of globalists would acknowledge that the multilateral system, as it currently stands, needs some fixing to be more relevant in people’s lives. Hence my suggestion: to consider a formal rapprochement between the EU and the OECD. Second, it would help us better address global challenges, such as the UN Sustainable Development Goals and climate change, by setting ambitious common standards and benchmarks with an enhanced legitimacy; Third, it would help boost trade and better stem protectionist tendencies; Fourth, it would bolster the EU’s efforts in addressing structural challenges by mobilising and leveraging OECD expertise, and so help EU member states implement structural policy recommendations, such as investing in skills and integrating migrants, or enhancing productivity and fostering a more sustainable “circular” economy; And fifth, a closer arrangement would enhance the political legitimacy and attractiveness of the OECD on the world stage, helping it to brush off its backoffice image and engage more with the public, while enhancing the EU’s own global network and outreach. One question mark arising from a closer relationship would be the extent to which OECD members that are not in the EU, particularly the major ones like the US and Japan, might influence EU affairs, but in my model the OECD would act strictly as a consultant, with no right to participate in internal EU decisionmaking. However, an EU contribution to the OECD budget could be considered. would require courageous, out-of-thebox thinking, not to mention a strategic high-level agreement. But it could eventually lead to a template for other international organisations to follow, with wins for the multilateral approach more broadly. Our state-centric system has long overlooked the power, legitimacy and norm-setting potential of certain “sovereign” international and regional organisations. Engaging with them on a more systematic basis cannot but consolidate multilateralism. The EU is admittedly a global actor that falls into this category. Sveikiname Lietuva˛ –welcome to the OECD, Lithuania! The Baltic country became the 36th member of the organisation on 5 July 2018, just one day before its Statehood Day, which commemorates the coronation of the first Lithuanian king, Mindaugas, in 1253. Lithuania is the third Baltic Republic to come on board, alongside Estonia (2010) and Latvia (2016). The country, which is also member of the EU, NATO and several other multilateral organisations, has a population of 3.1 million, uses the euro as currency and has one of the fastest growing economies in the OECD area–its GDP grew by 3.8% in 2017, above the OECD average of 2.6%. According to the OECD Economic Survey of Lithuania 2018, Lithuania’s economy has been quickly catching up with the OECD average, as the country’s GDP per head leapt from 36% to 73% of the OECD level between 2000 and 2017. Unemployment has dropped steeply, from 9.1% in 2015 to an estimated 6.6% in 2018. Public finances have also stabilised, thanks to ambitious reforms, the report notes. Lithuania has a smart workforce, with 39% of its adult population (aged over 25) having tertiary education, compared to the OECD average of 35%. The public’s average rating of the quality of health services in Lithuania has increased from 5.1 to 6.3–on a scale from 1 to 10–between 2003 and 2016, the European quality of life survey shows. Lithuania faces challenges, as the new economic survey argues, such as to reduce its above average inequality, population decline and need to boost low productivity. The strip originally appeared in OECD Observer No 267, May-June 2008. Focus on economics OECD Economic Outlook, Volume 2018 Issue 1 This issue includes a general assessment, a special chapter on policy challenges from closer international trade and financial integration, and a chapter summarising developments and providing projections for each individual country, and a statistical annex. OECD Compendium of Productivity Indicators 2018 This report presents a comprehensive overview of recent and longerterm trends in productivity levels and growth in OECD countries, accession countries, key partners and some G20 countries. It includes measures of labour productivity, capital productivity and multifactor productivity, as well as indicators of international competitiveness. Tax Policy Reforms 2018 This third edition covers the latest tax policy reforms in all OECD countries, as well as in Argentina, Indonesia and South Africa. Monitoring tax policy reforms and understanding the context in which they were undertaken is crucial to informing tax policy discussions and to supporting governments in the assessment and design of tax reforms. After years of crisis, the European economy is expanding robustly, and GDP growth is projected to remain strong in 2018 and 2019. With an expansion underway, attention needs to shift to Europe’s long-term challenges. To further strengthen the confidence of all its citizens, the European Union needs to focus on policies that support a stronger and more inclusive growth. OECD Sovereign Borrowing Outlook 2018 The 2018 edition of the OECD Sovereign Borrowing Outlook presents gross borrowing requirements, net borrowing requirements, central government marketable debt and funding strategies for the OECD area and country groupings. OECD Employment Outlook 2018 The 2018 edition of the OECD Employment Outlook reviews labour market trends and prospects in OECD countries. Wage growth remains sluggish due to low inflation expectations, weak productivity growth and adverse trends in low-pay jobs. Trade Facilitation and the Global Economy In a globalised world, where goods cross borders many times as intermediate and as final products, trade facilitation is essential to lowering overall trade costs and increasing economic welfare, in particular for developing and emerging economies. Facilitation efforts undertaken by various countries around the world also show that the benefits of such measures clearly compensate the costs and challenges posed by their implementation. Going for Growth is the OECD’s regular report on structural reforms in policy areas that have been identified as priorities to boost incomes in OECD and selected non-OECD countries (Argentina, Brazil, the People’s Republic of China, Colombia, Costa Rica, India, Indonesia, Lithuania, the Russian Federation and South Africa). The next full report will be published in 2019. This interim report sets out the Inclusive Framework’s agreed direction of work on digitalisation and the international tax rules through to 2020. It describes how digitalisation is also affecting other areas of the tax system, providing tax authorities with new tools that are translating into improvements in taxpayer services, improving the efficiency of tax collection and detecting tax evasion. Yes, please sign me up for four issues. This is partly due to people taking lowerpaying, less-productive jobs after being cut off from crisis-period unemployment benefits. The number of public assistance recipients shot up after 2008 but dropped quickly as people exhausted their rights to benefits. Without welfare, workers took on lower paying jobs than they might have otherwise, especially less productive, part-time positions. This is reflected in decreased hourly productivity rates since 2008. Prior to the crisis, productivity was growing 2.3% annually in OECD countries. Now, average productivity growth is 1.2%. For the first time since 2008, employment in OECD countries is higher than it was before the financial crisis. But this doesn’t mean that jobs are of higher quality or better paid than they used to be. In fact, wage stagnation and job inequality are higher than pre-crisis levels for low and middle earners, and wage growth has been limited to the top 1% of income earners only. Q2-2018	-11.9	-10.3 Q2-2018	10.6	11.1 ..	..
Q2-2018	73.8	45.4 Q2-2018	6.9	7.7 ..	..
Q3-2018	-6.6	-6.2 ..	.. ..	..
Q2-2018	-1.5	46.1 ..	.. ..	.. Gross domestic product: Volume series; seasonally adjusted. Leading indicators: A composite indicator based on other indicators of economic activity, which signals cyclical movements in industrial production from six to nine months in advance. Consumer price index: Measures changes in average retail prices of a fixed basket of goods and services. Current balance: Billion US$; seasonally adjusted. Unemployment rate: % of civilian labour force, standardised unemployment rate; national definitions for Iceland, Mexico and Turkey; seasonally adjusted apart from Turkey. Interest rate: Three months. Current balance data are reported according to the BPM6 classification. ..=not available, 1 Key Partners. Source: Main Economic Indicators. September 2018. The industries with lowest growth vary from country to country. In the US and Sweden, high-tech industries like electronics have seen some of the largest productivity decelerations. In the Czech Republic and Slovenia, lower-tech industries like textiles have stagnated most. Policymakers have finally started to recognise the drivers of their country’s slowdowns and are tentatively taking measures to reinvigorate growth. Everyone wants a raise. But the reality is that compensation growth is slowing down, and it has been for years. The cause? Economies have been stuck in a low-growth trap. Over the past two decades, labour productivity growth has slowed in every major advanced economy in the world. And although the volatility of the 2008 crisis inspired more cautious economic predictions, the low-growth trend is undeniable. Topping the lowgrowth list are G7 countries like France, the UK, the US and Canada.